A Social custom is defined as an act that is adopted, or a behavior to people. A topic mentioned in New Year’s Day is when speaking on the Dutch keeping their tradition and having a big party for New Years Day. 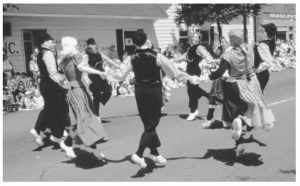 These Dutch Americans are performing in the 1985 Tulip Festival, an annual event that takes place in Holland, Michigan. In Edwards Shils, “Tradition” he talks on how family customs are passed down and not let go of. These customs are continued to be practiced without there being a limitation to them. He states, “All existing things have a past. Nothing which happens escapes completely from the grip of the past; some events scarcely escape at all from its grip. Much of what exists is a persistence or reproduction of what existed earlier.” (1). This is similar to the way the Dutch came into the America’s and for New Year’s Day would continue their practices. This being different to how the high classed had their parties of fashion and money to celebrate in these events. The Dutch brought their tradition to continue to pass it on in New York. A social custom is important when being in family and passing on certain events that they found meaningful to be surrounded by. It is important to look at this when focusing on families of high class and low class. The reason to this is because many high-status people were attendees in this hotel’s New Years Celebration but many of the lower-class status were not. Like this family of Dutch descent, we can see that tradition is continued to pass on and it is valued. Also, this adds on to the way high class families were pampering themselves while low class families, including maids, were staying home or working. These low class families were neither welcomed to these events and could neither afford them. Shils, Edward. “Tradition.” Comparative Studies in Society and History, vol. 13, no. 2, 1971, pp. 122–159. JSTOR, JSTOR, www.jstor.org/stable/178104.